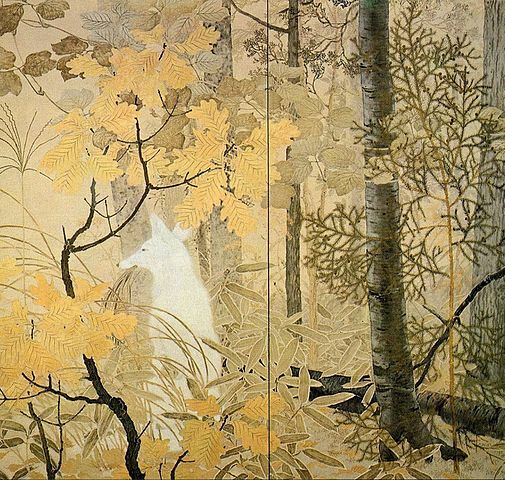 The artist Kanzan Shimomura (1873 to 1930) is a famous son of Wakayama and just like this part of Japan is rich in culture and faith, Kanzan also had a spiritual and cultural dimension to his art. Indeed, he was born into a family known for Noh actors. Therefore, his place of birth, the bloodline of Noh actors in his family, and being taught by exemplary artists in his early life molded him greatly. 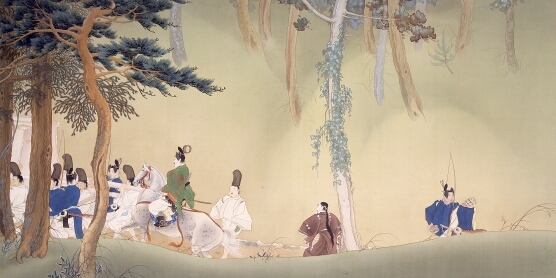 In the most pristine art of Kanzan, you can’t feel the revolutionary factors of the Meiji Restoration of 1868. Instead, a link with the past, while adopting new ideas and learning Western realism during his stay in England, leads to a sense of tranquility and continuity. This notably applies to Kanzan’s most famous art because the revolutionary fervor of the Meiji period seems but a distant reality. Despite Kanzan moving to Tokyo at the age of 8, the rich cultural and religious legacy of Wakayama must have impacted to a certain degree. After all, the prefecture of Wakayama is blessed with famous holy Buddhist and Shinto places of worship along with famous walks and waterfalls. Hence, the Buddhist angle to Koyasan and Negoro-ji – and the amazing walking route of Kumano Kodo remains mysterious even today. Therefore, the spiritual and cultural angle to the art of Kanzan equally feels like the mystery surrounding the above-named places and the fabulous Nachi Waterfall, where people pray at the Hiro-jinja Shrine. Kanzan studied under Kano Hogai (1828-1888) and after he passed away he continued his artistic learning under Hashimoto Gaho (1835-1908). Hogai, despite firmly belonging to the artistic world of the school of Kano, equally experimented with new concepts emanating from Western art styles. Therefore, you can feel the strong connection in the early period of Kanzan’s art with Hogai and Gaho in relation to thought patterns. Gaho, just like Hogai, belongs to the world of Kano and he also fused this rich artistic world with aspects of Western approaches to art. 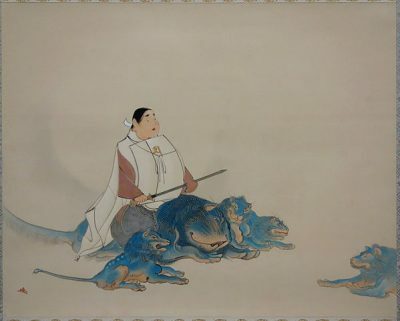 The legacy of Gaho equally applies to artists he taught because his spirit lived on to various degrees within the art and thought patterns of Kanzan, Kawai Gyokudo, and Yokoyama Taikan. In the early twentieth century, Kanzan stayed in England and just like his mentors the impact of Western art styles impacted on him. Despite this, the art of Kanzan is a fusion of various Japanese forms of art and this notably applies to Buddhist art, Kano, Rinpa, and the school of Tosa. Therefore, the world of emaki – and other areas just mentioned above – continued to pull at the artistic soul of Kanzan during his early artistic life.